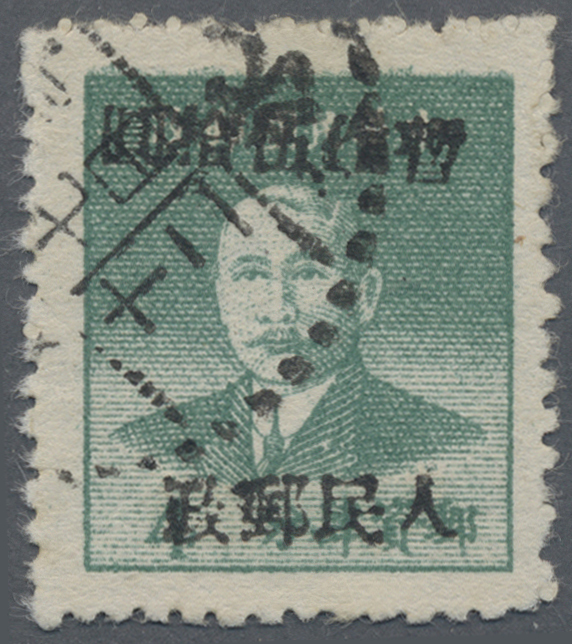 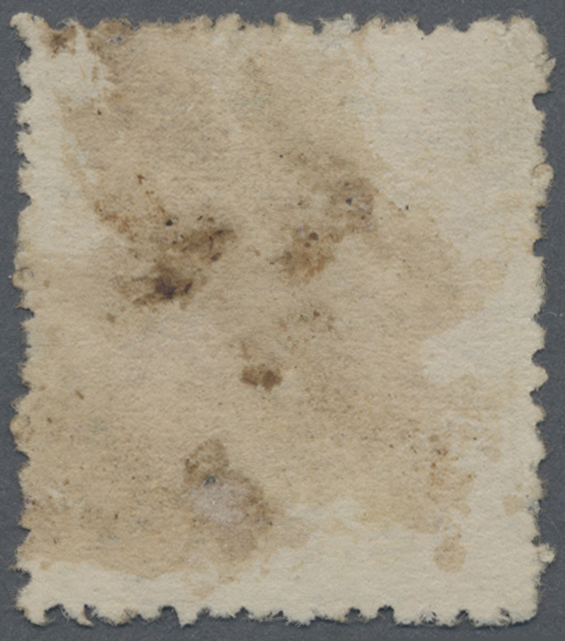 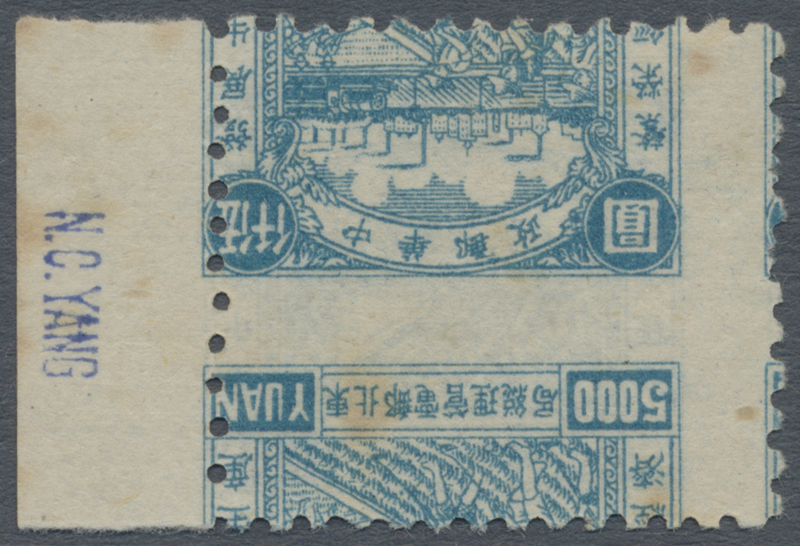 5229 gestempelt (marked) Northwest China, Ningxia, local issue Yinchuan, 1949, "People’s Post Temporarily Used for and new value" ovpt., $50/4c, used, VF, (Yang NWL17). 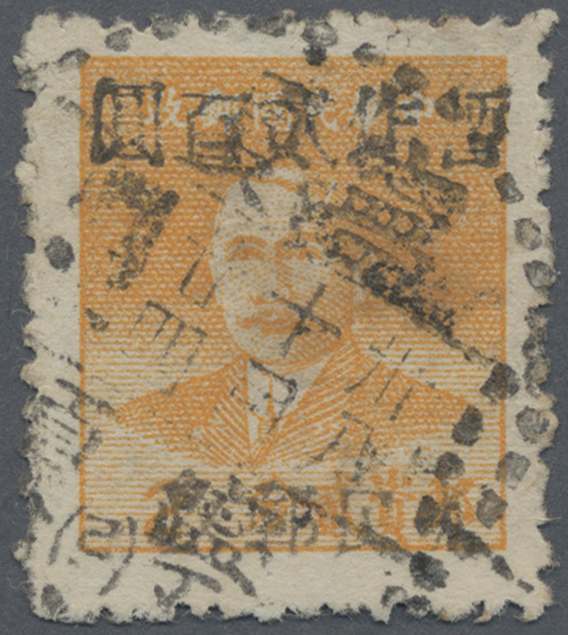 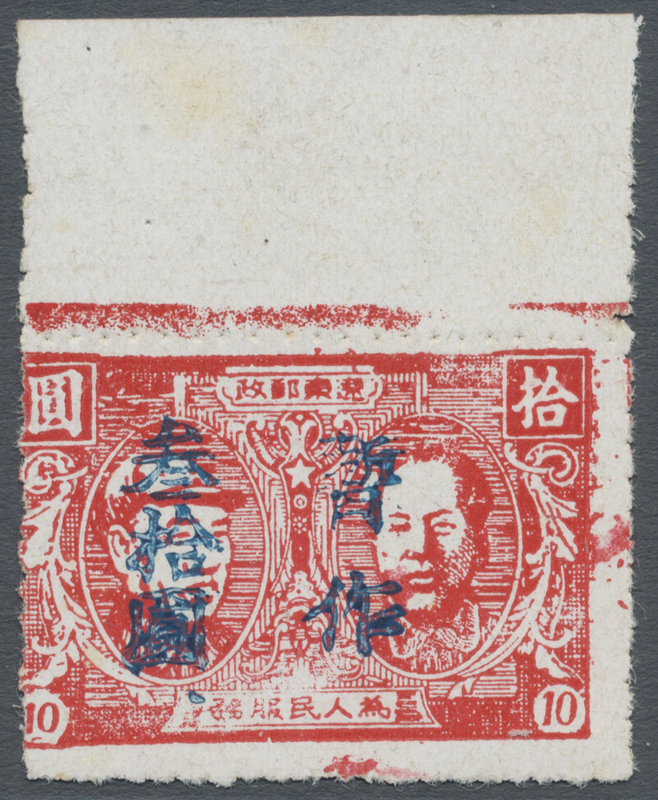 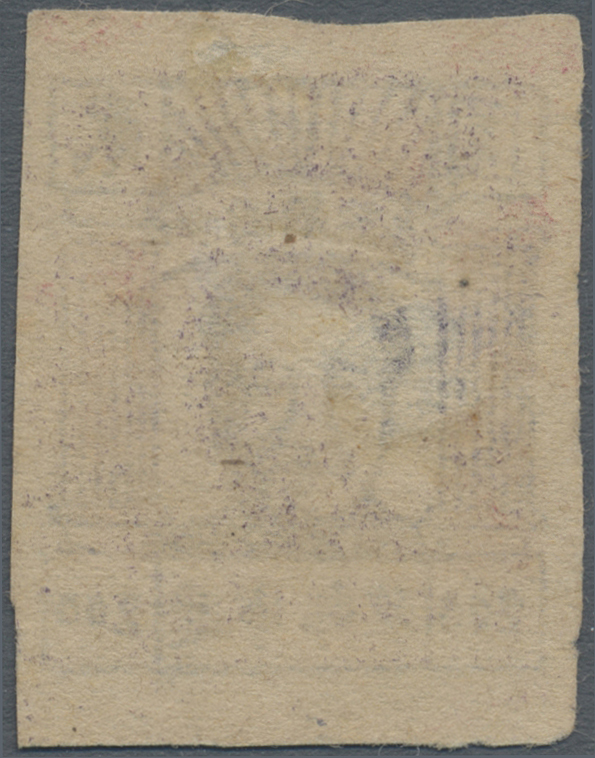 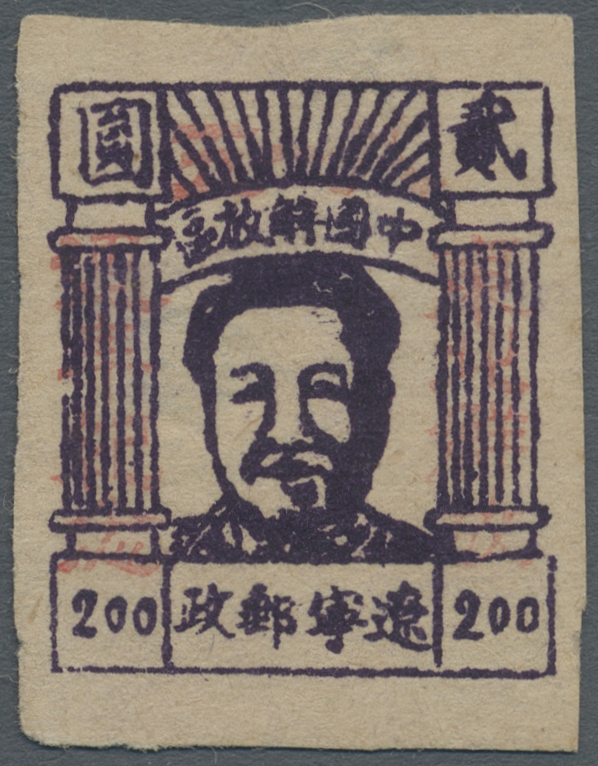 5230 gestempelt (marked) Northwest China, Ningxia, local issue Yinchuan, 1949, "People’s Post Temporarily Used for and new value" ovpt., $200/2c, used, VF, (Yang NWL19). 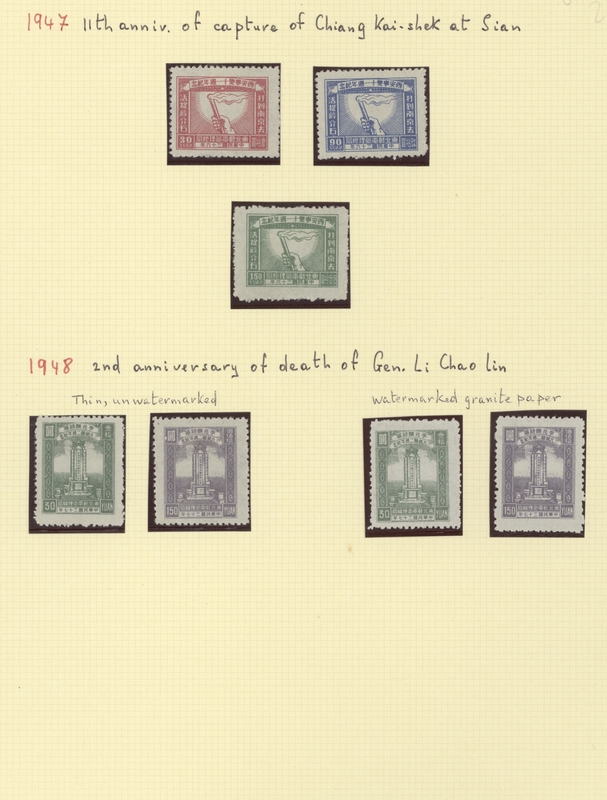 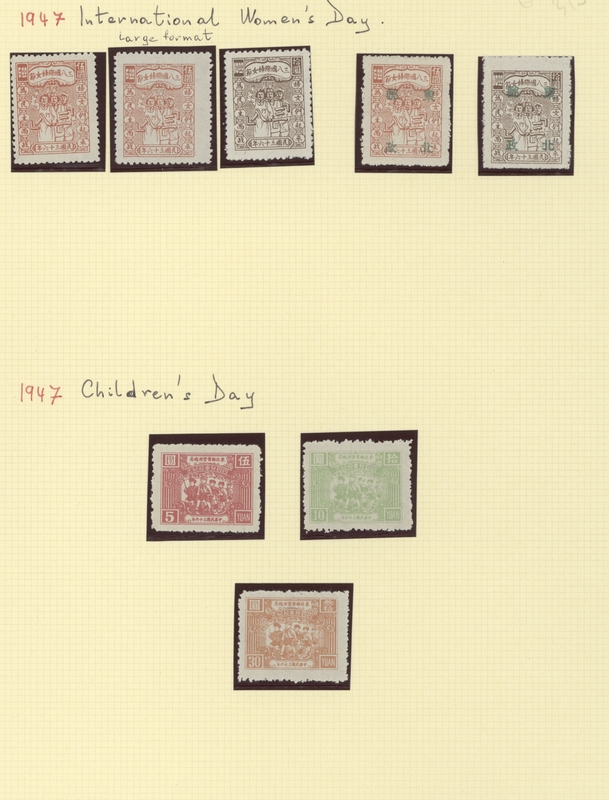 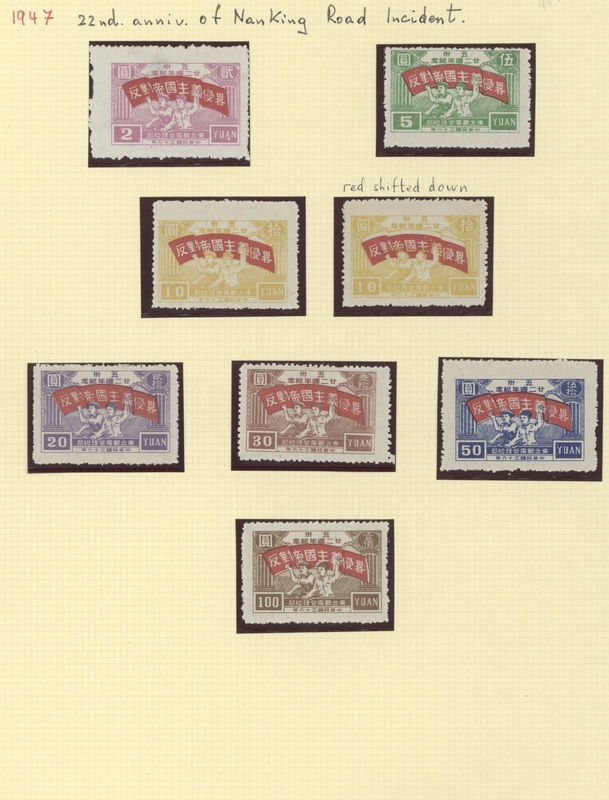 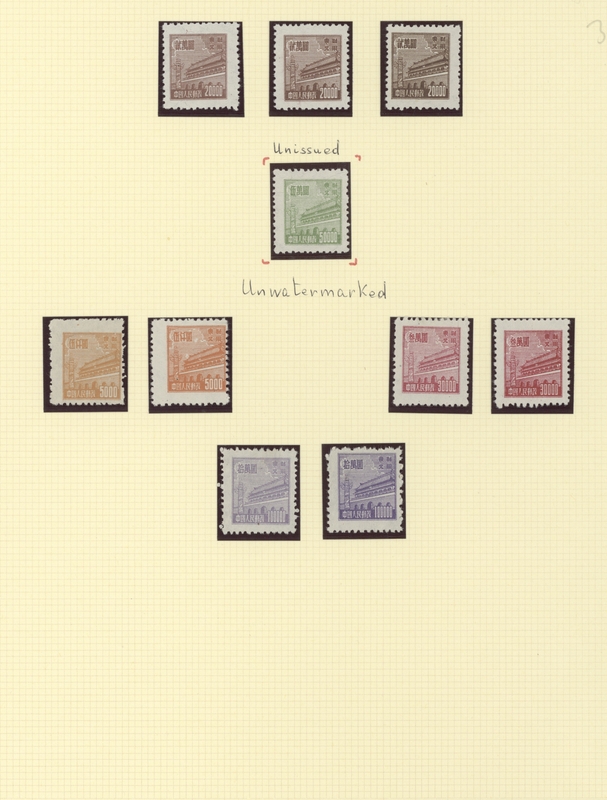 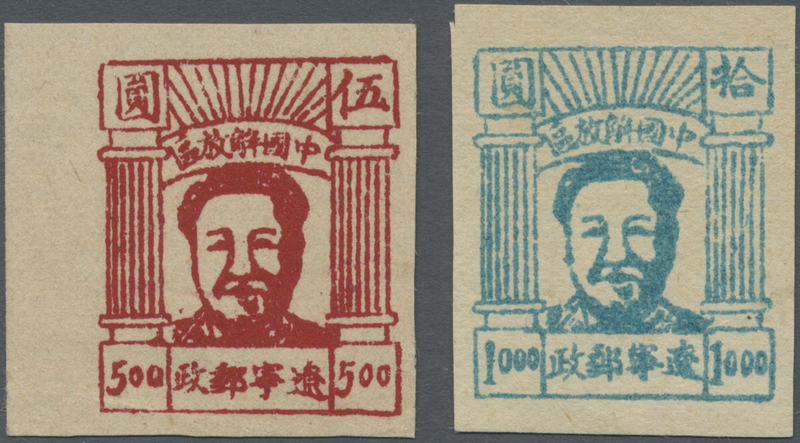 5245 ungebraucht ohne Gummi (unused without gum) (*) gestempelt (marked) 88-92 Northeast China, Northeast People’s Post, 1948, "4th / 5th Print Mao Zedong Stamps (Northeast)", $50 - $250, cpl. 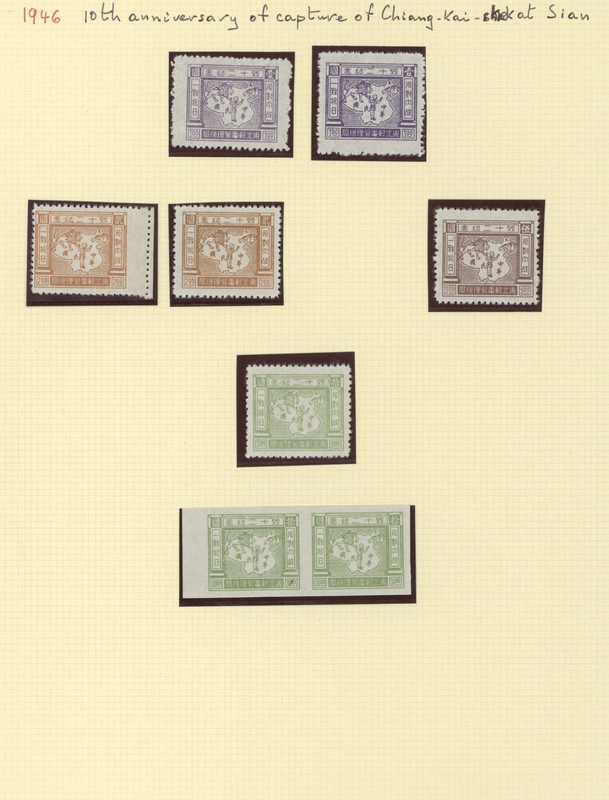 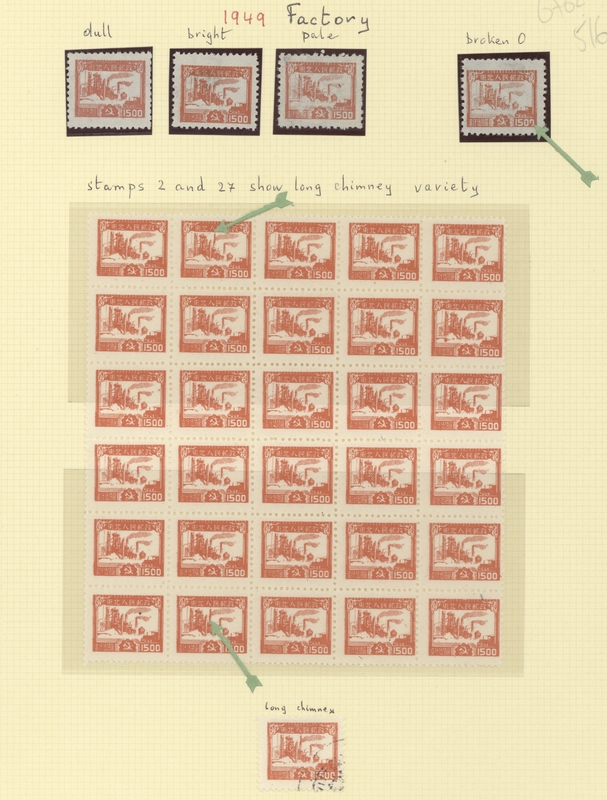 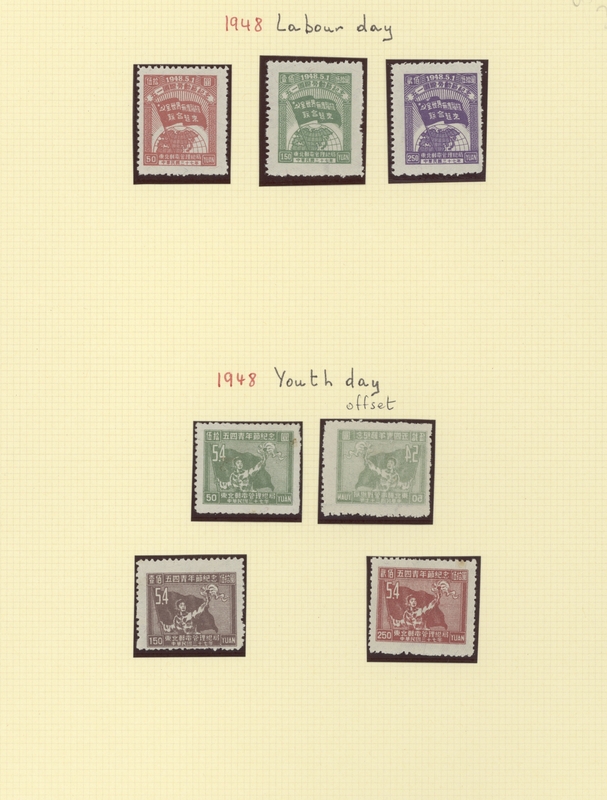 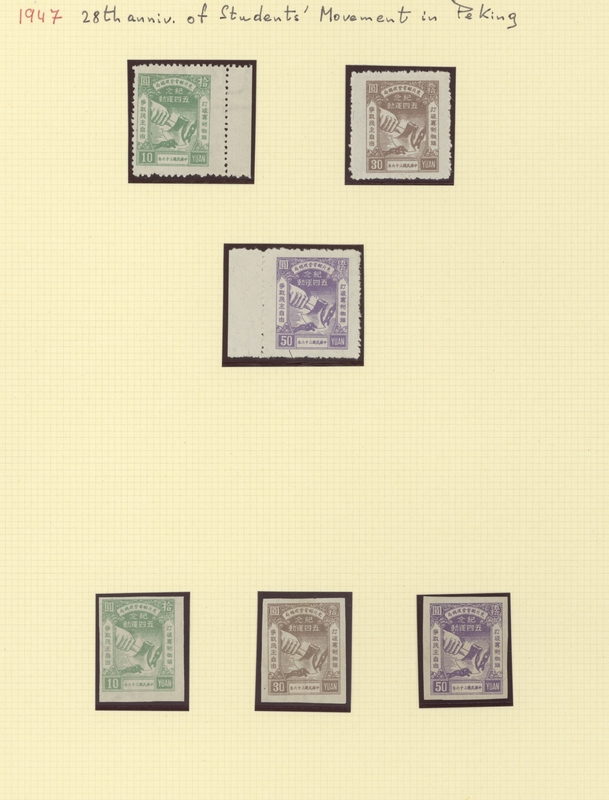 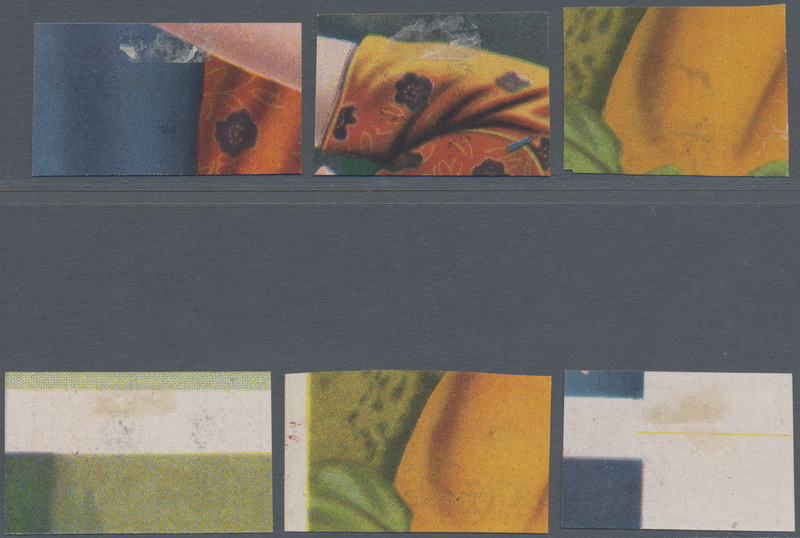 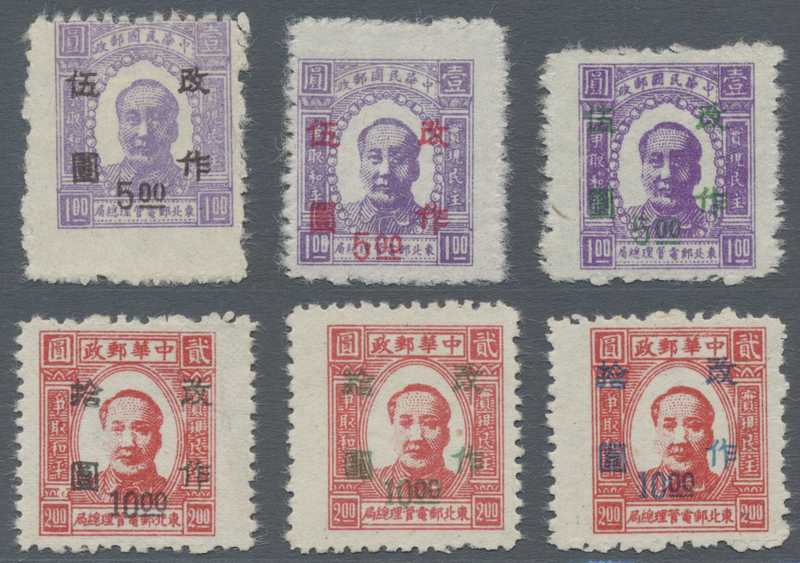 set of 4, mint no gum as issued, varieties (paper types), F-VF, additional 5 used copies, these with faults (Yang NE109-112). 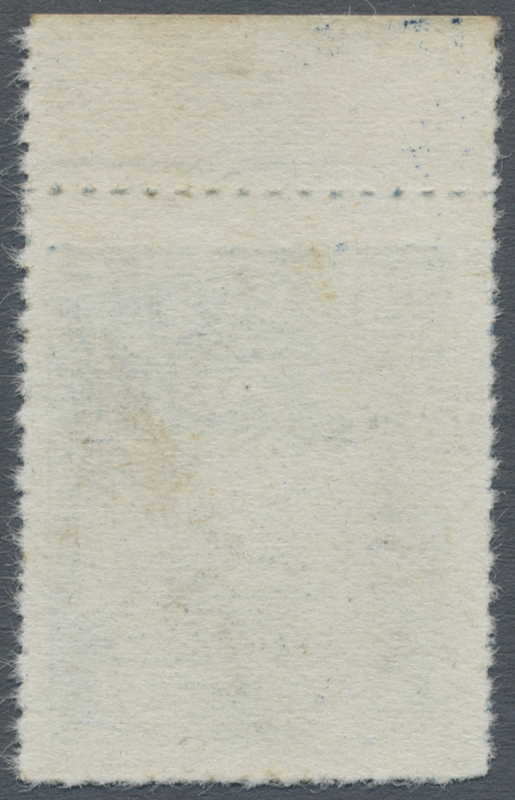 $300 - $1000, cpl. 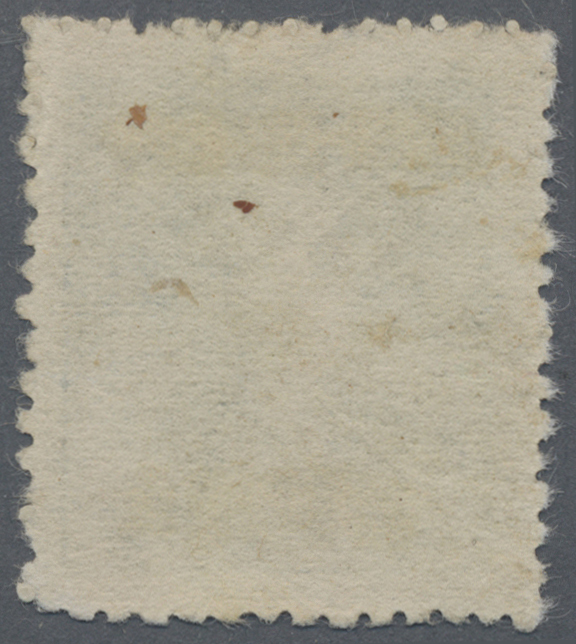 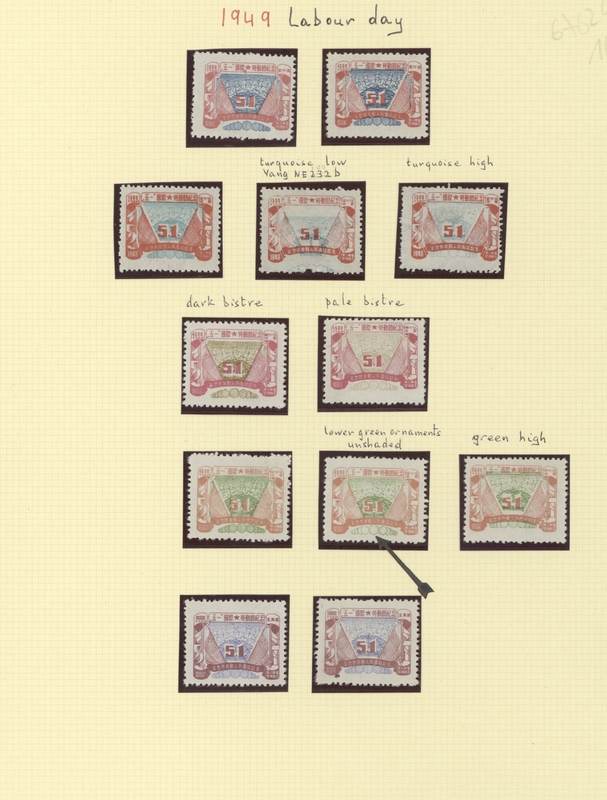 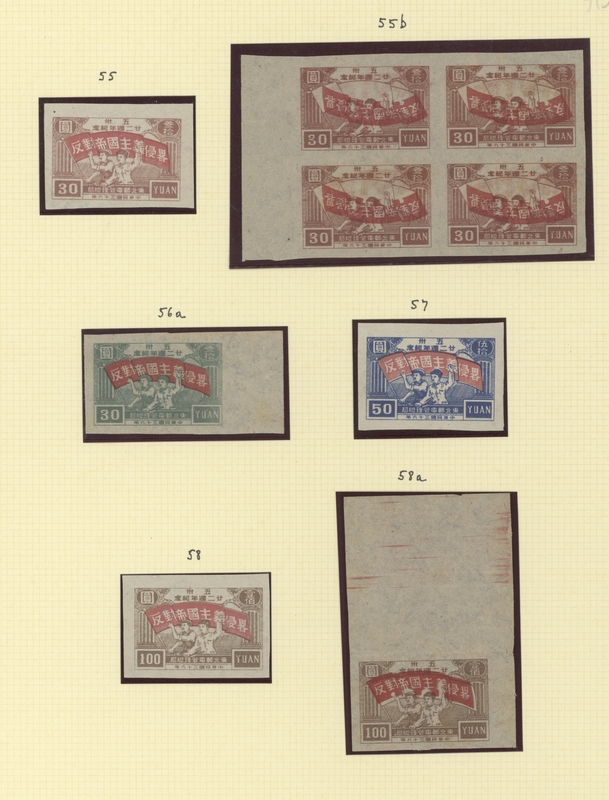 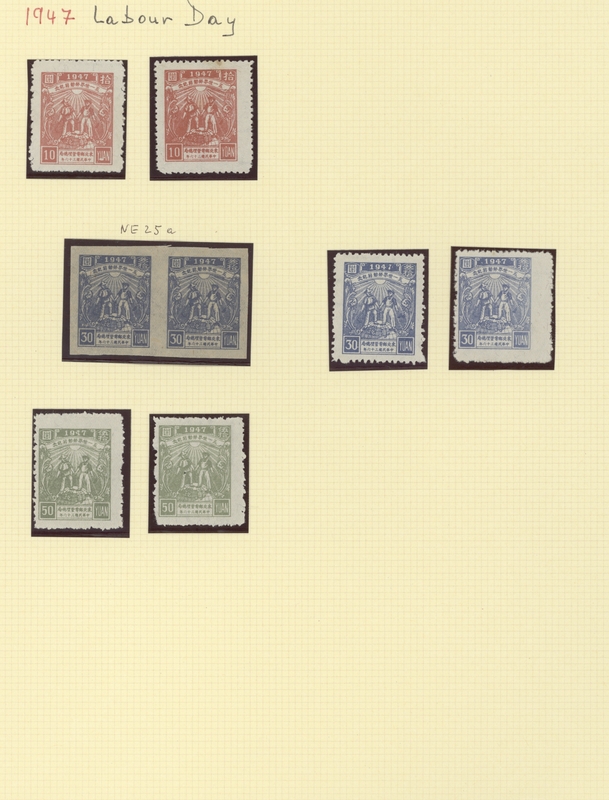 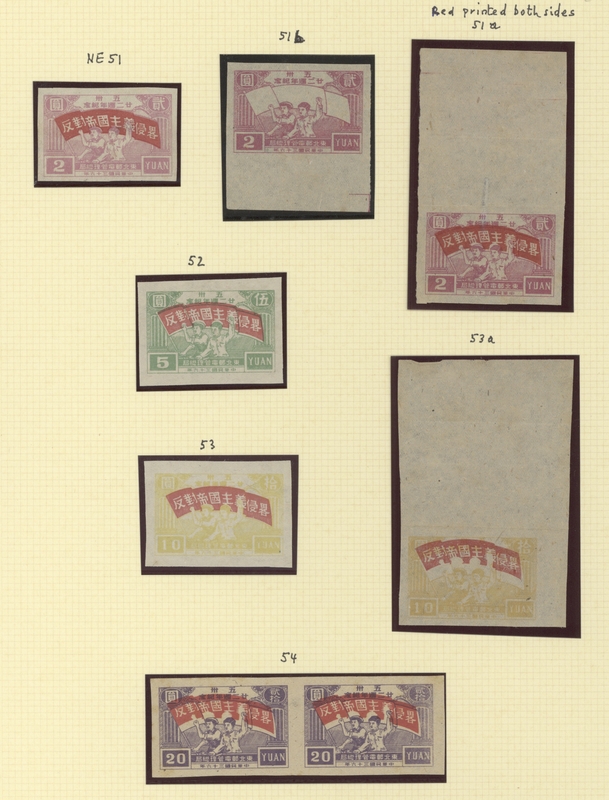 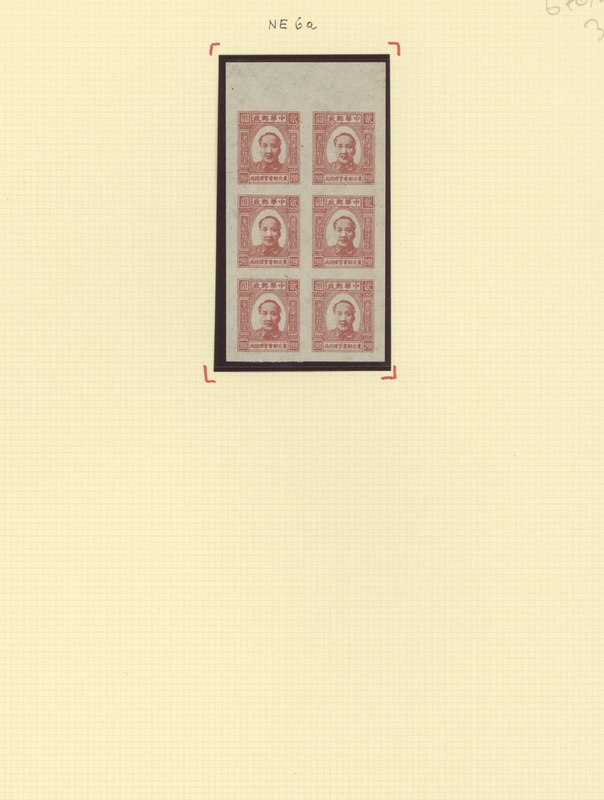 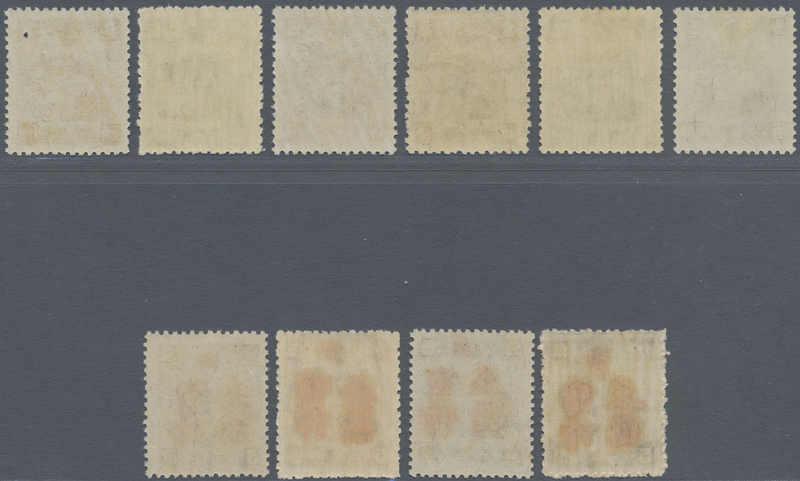 set of 2, mint no gum as issued, varieties (paper types), F-VF, additional 2 used copies, some toning, (Yang NE123-124, NE124a/b), total 24 copies. 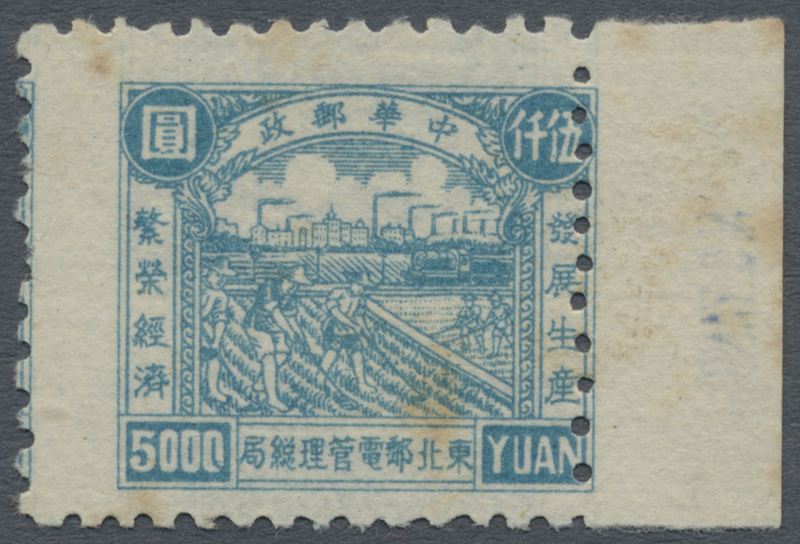 5249 ungebraucht ohne Gummi (unused without gum) (*) Northeast China, Northeast People’s Post, 1949, "Industrial and Agriculture Issue", $5.000, mint no gum as issued, variety printed on both side, some tone spots (Yang NE139a). 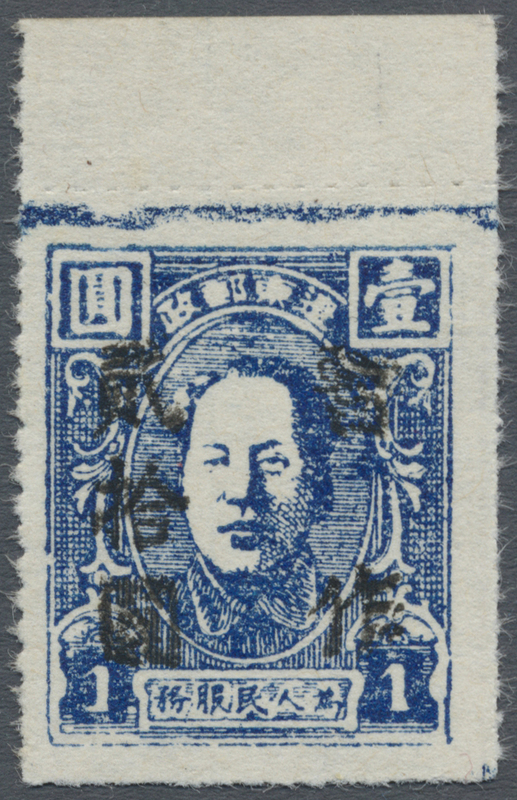 Signature "N.C. YANG"
5250 ungebraucht ohne Gummi (unused without gum) (*) gestempelt (marked) 123-127, 148-151, 15 Northeast China, Northeast People’s Post, 1949, "6th Print Mao Zedong Stamps (Northeast)", $300 - $6.500, cpl. 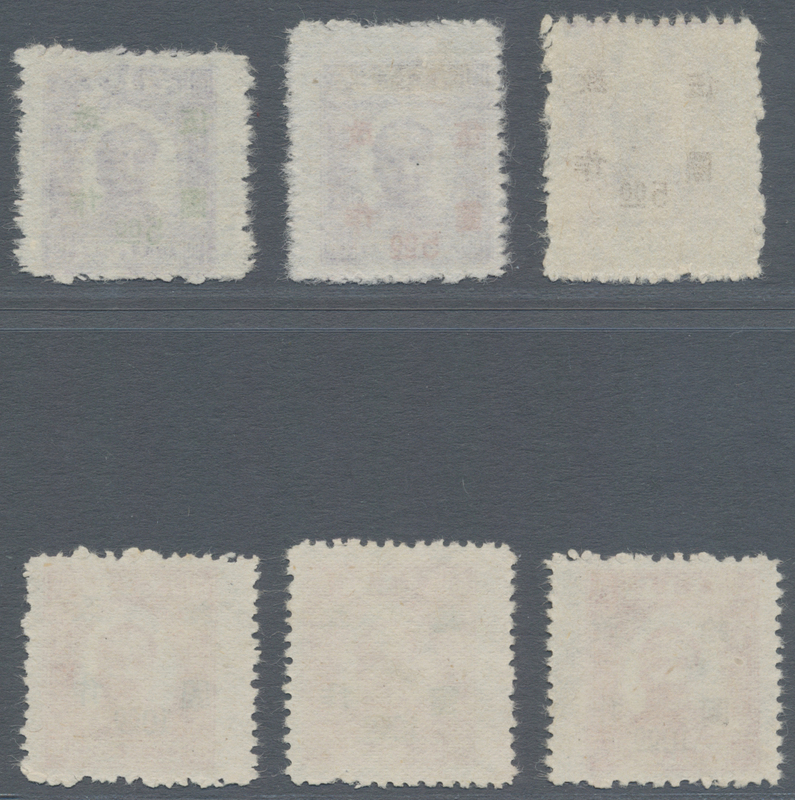 set of 5, mint no gum as issued, paper type varieties F-VF, additional 4 used copies, these with toning (Yang NE134-138). 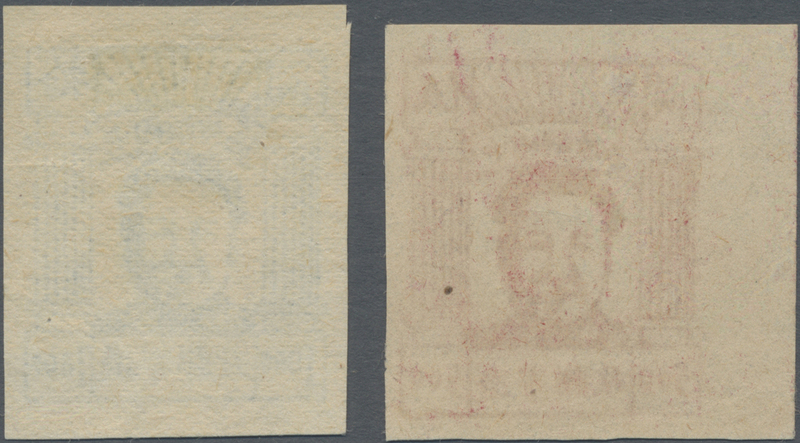 "6th Surcharges Overprinted with Change To and new value" ovpt., $2.000/$500 - $35.000/$300, cpl. 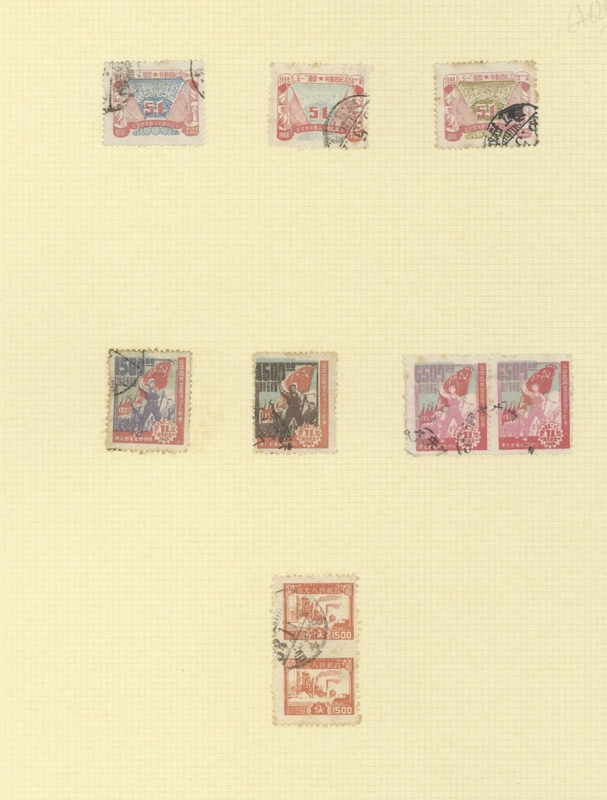 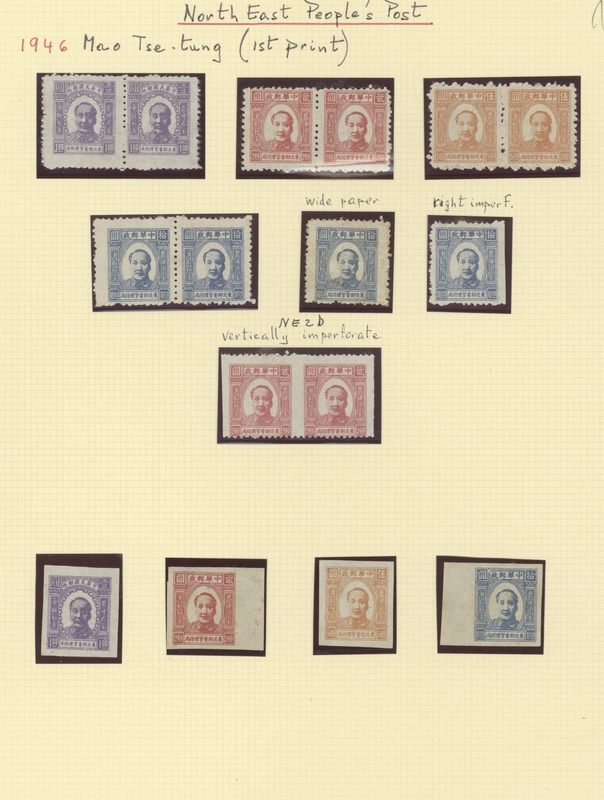 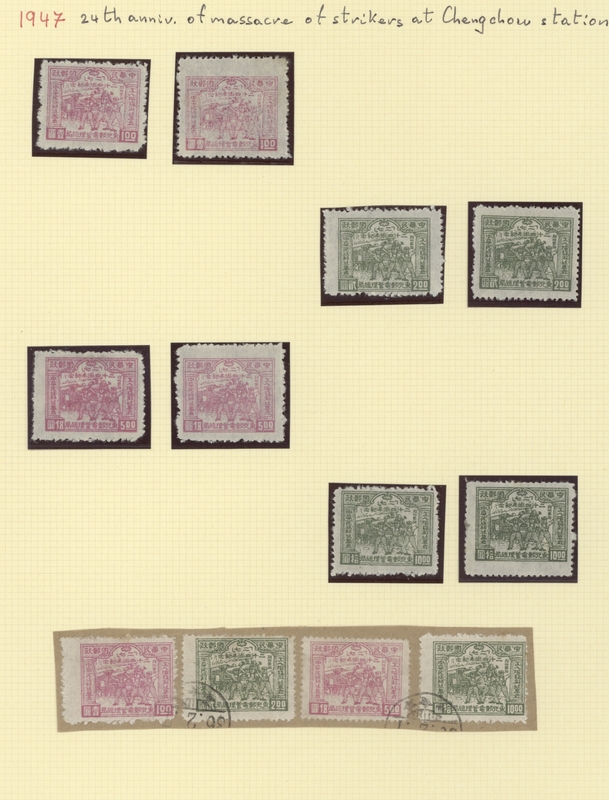 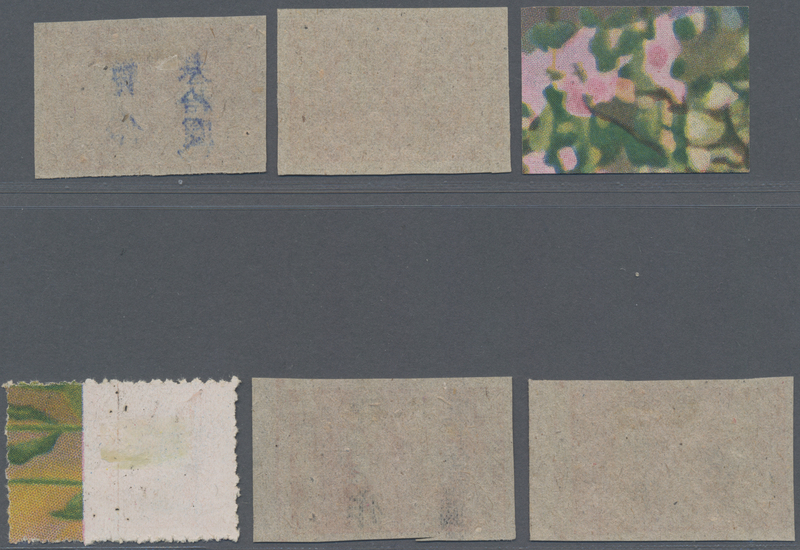 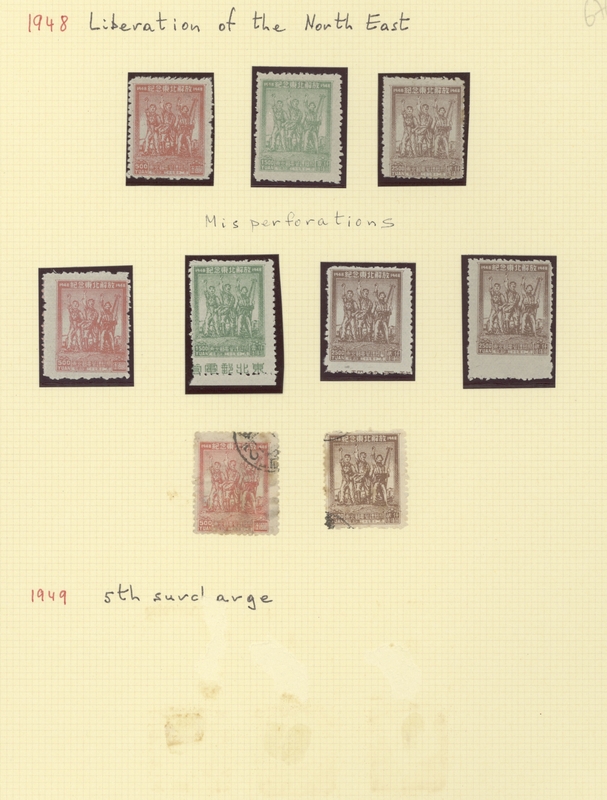 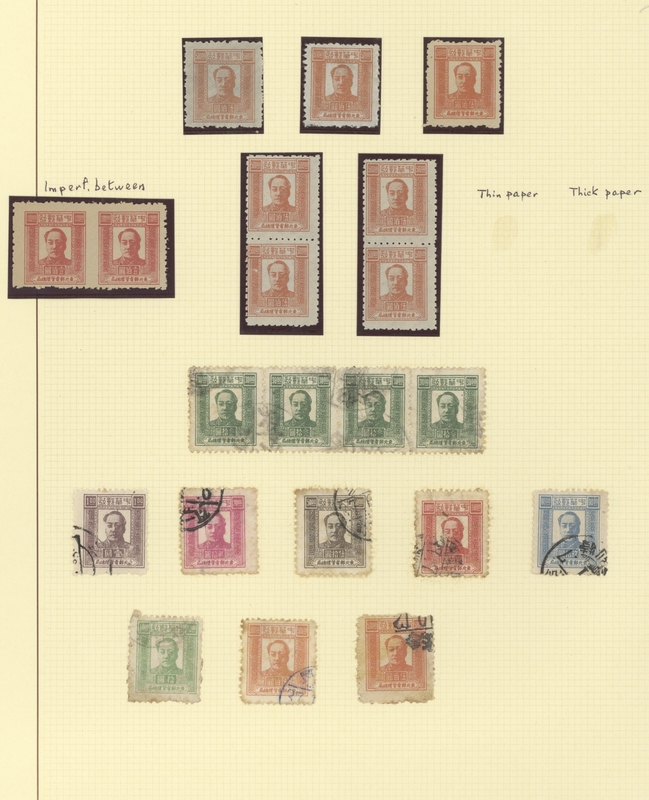 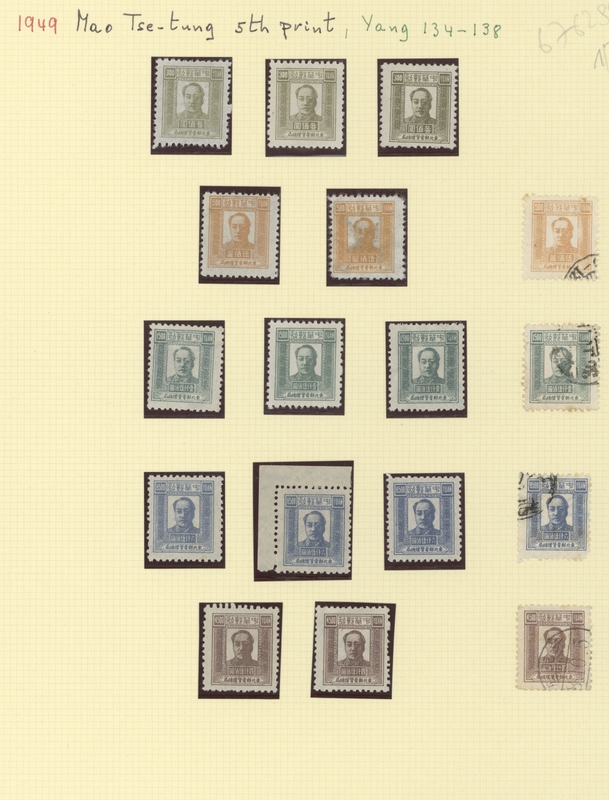 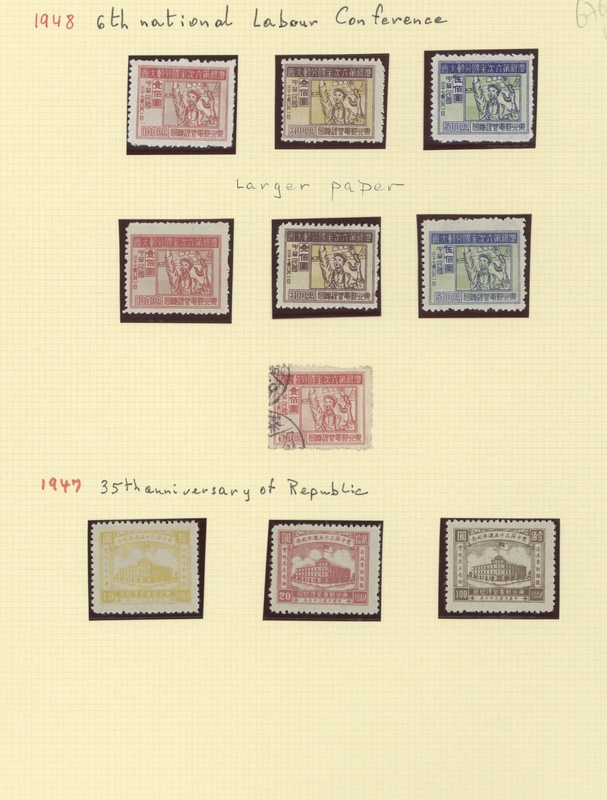 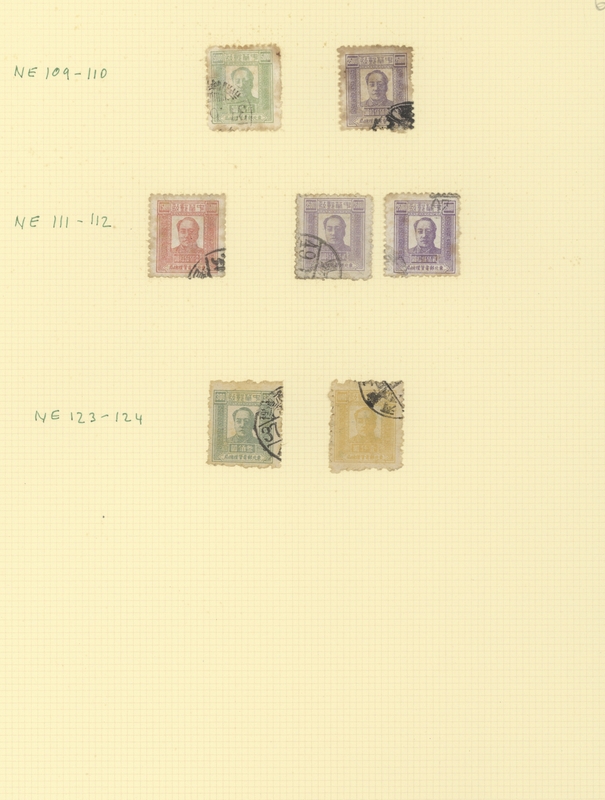 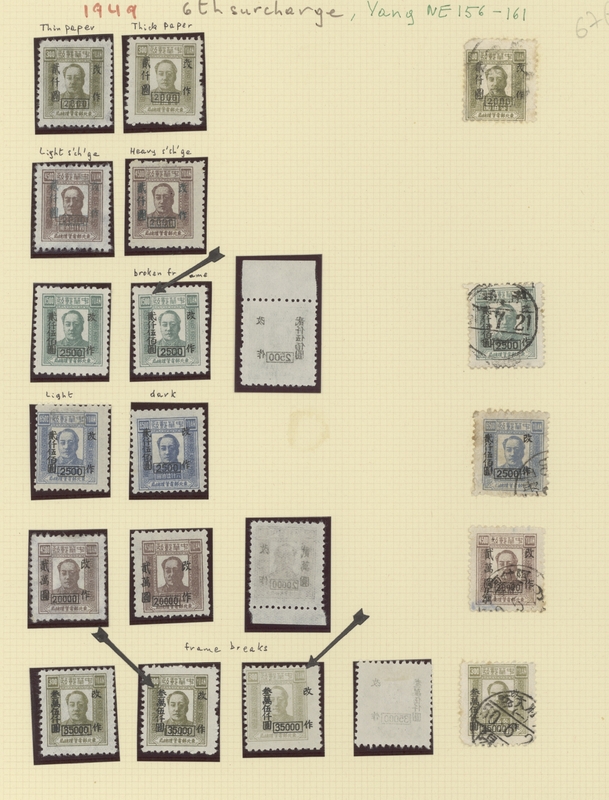 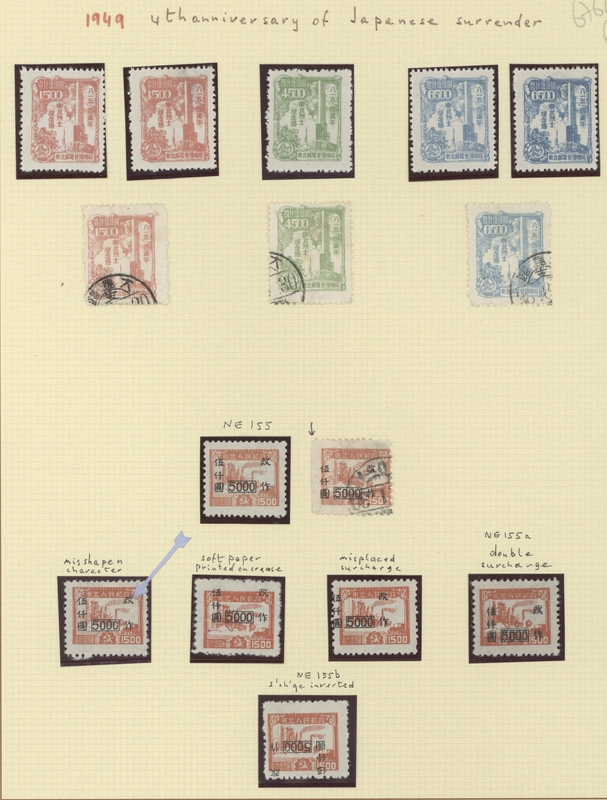 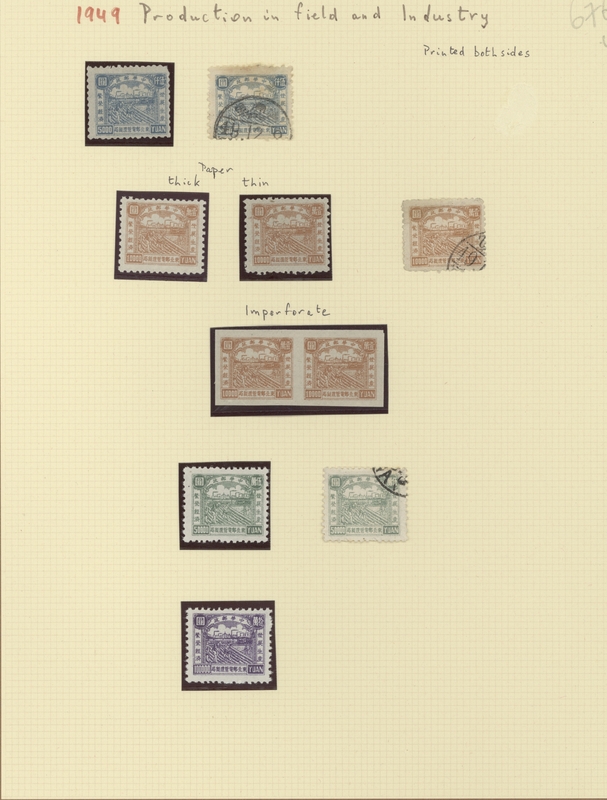 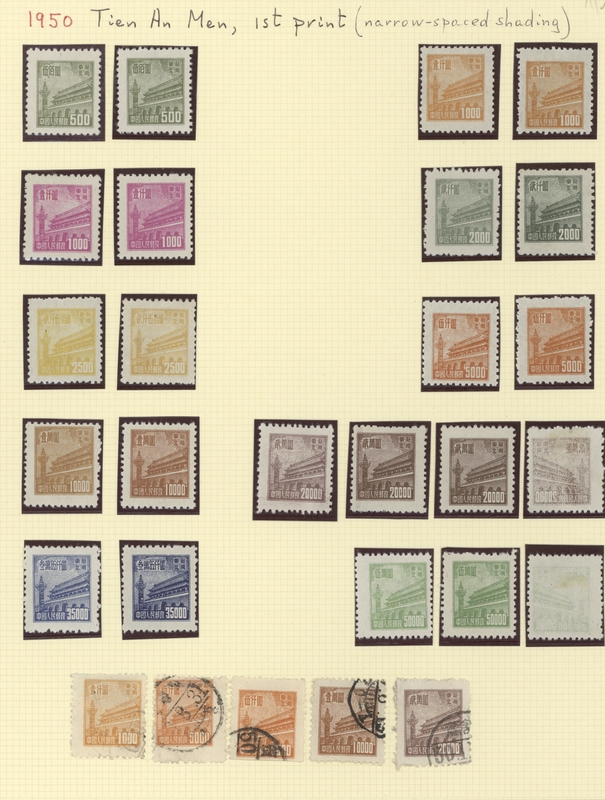 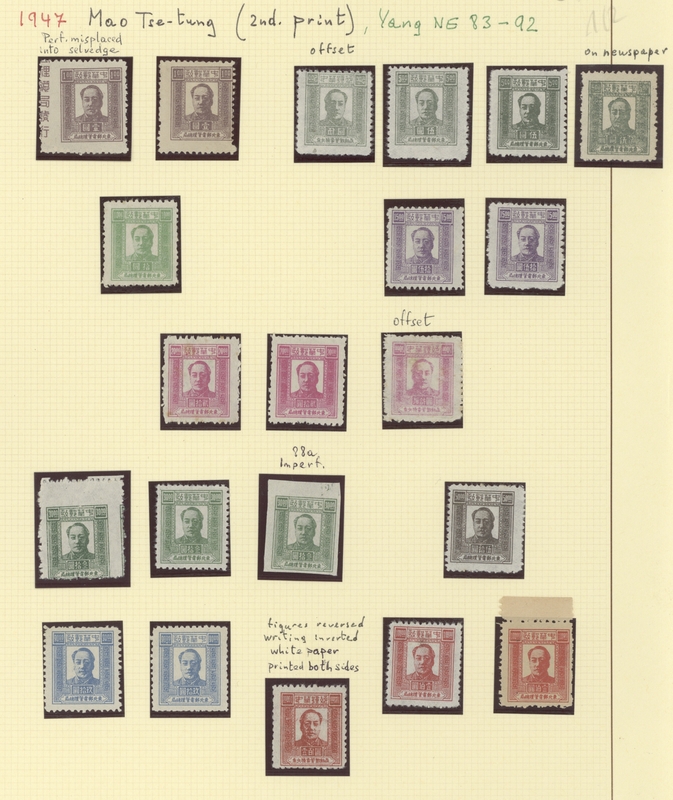 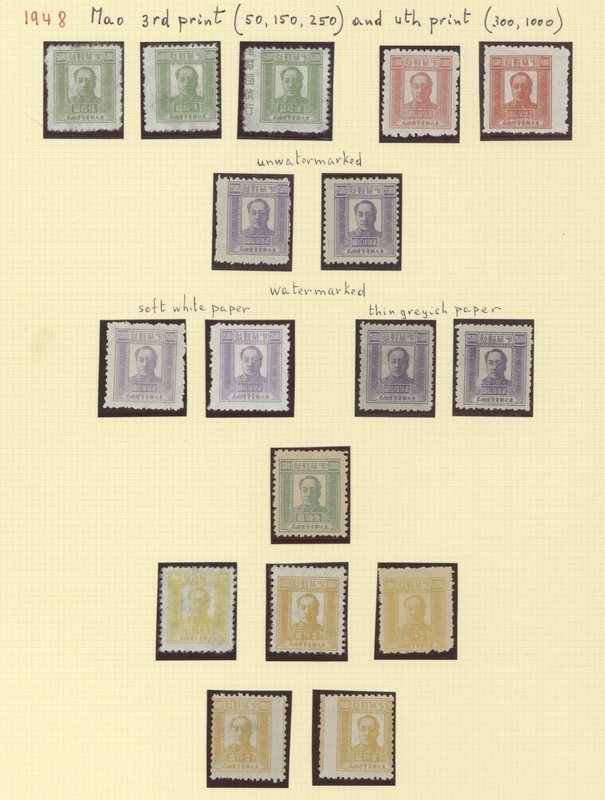 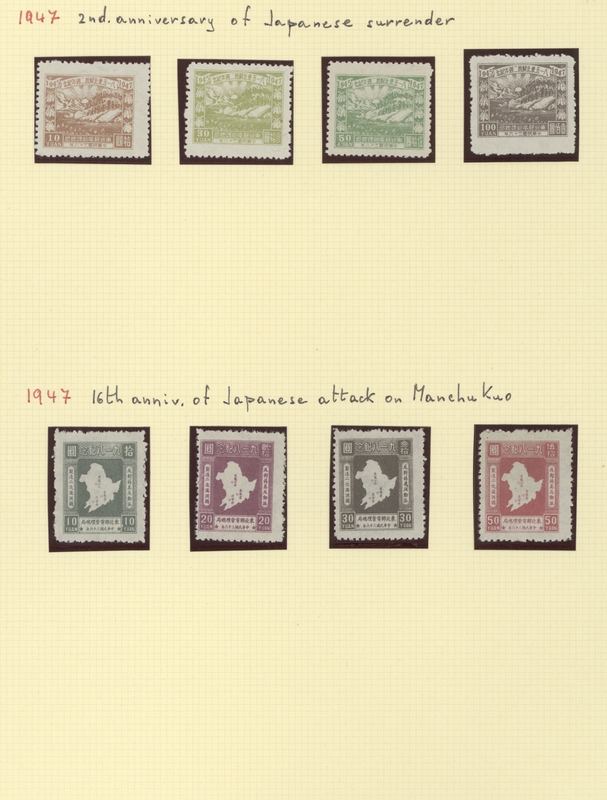 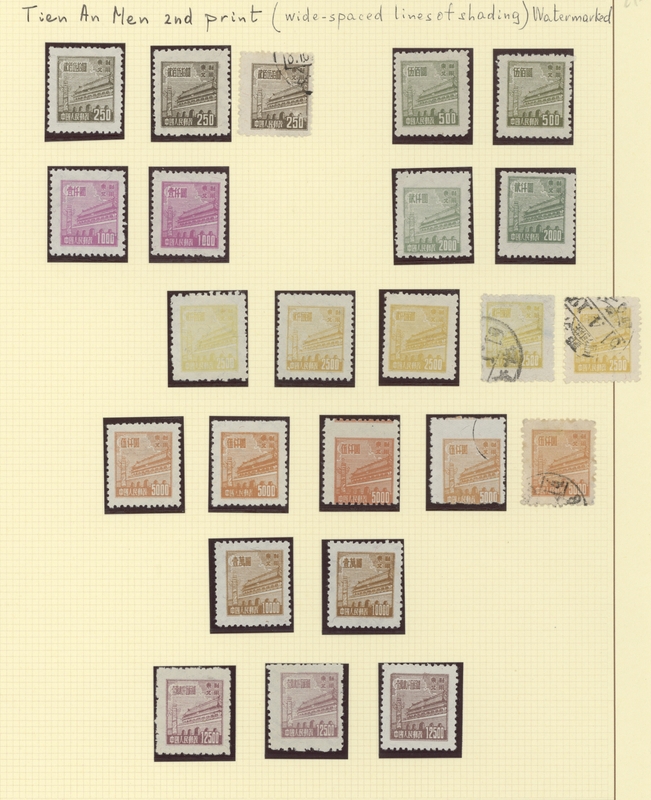 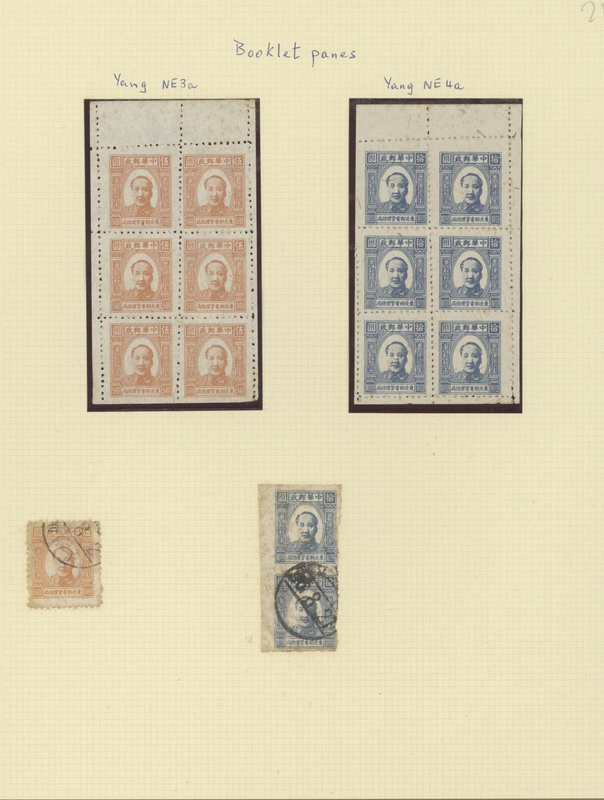 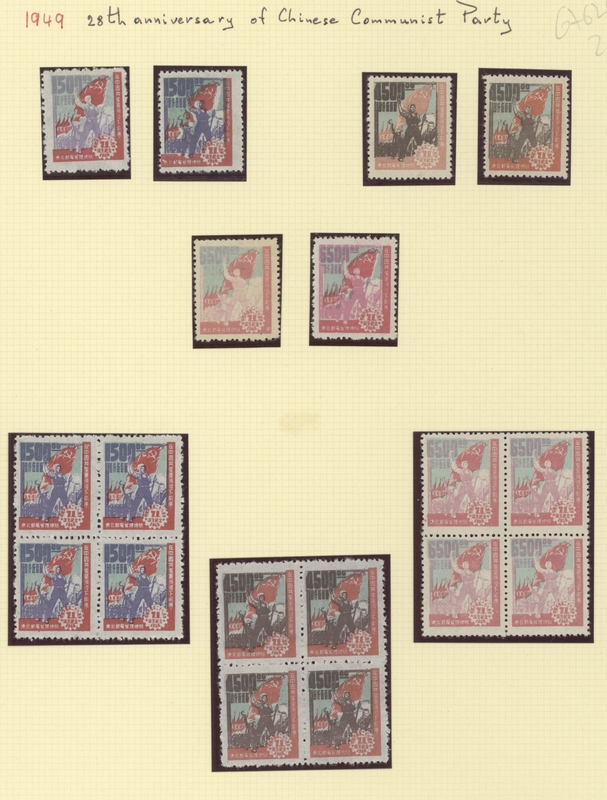 set of 6, mint no gum as issued, plus various varieties, F-VF, additional 5 used copies, these with faults (Yang NE156-161), total 38 copies. 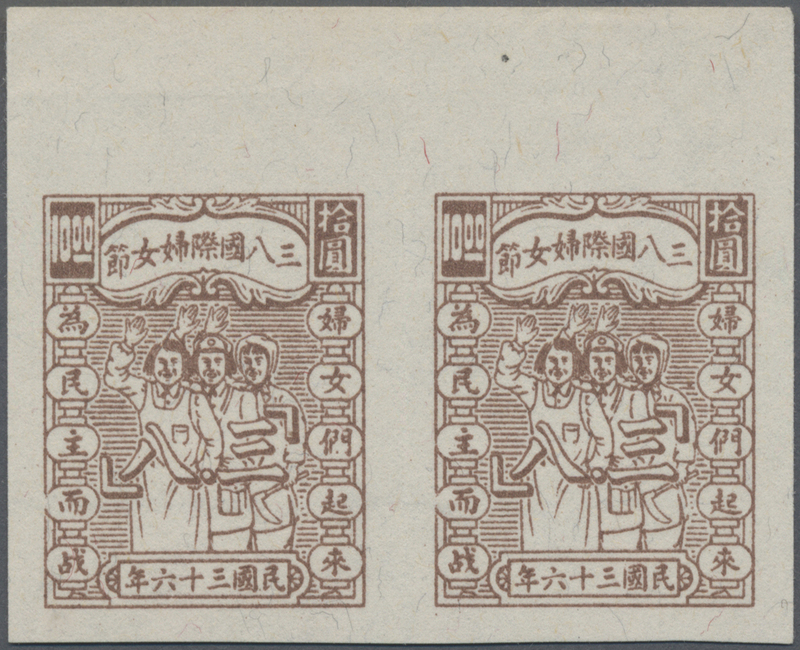 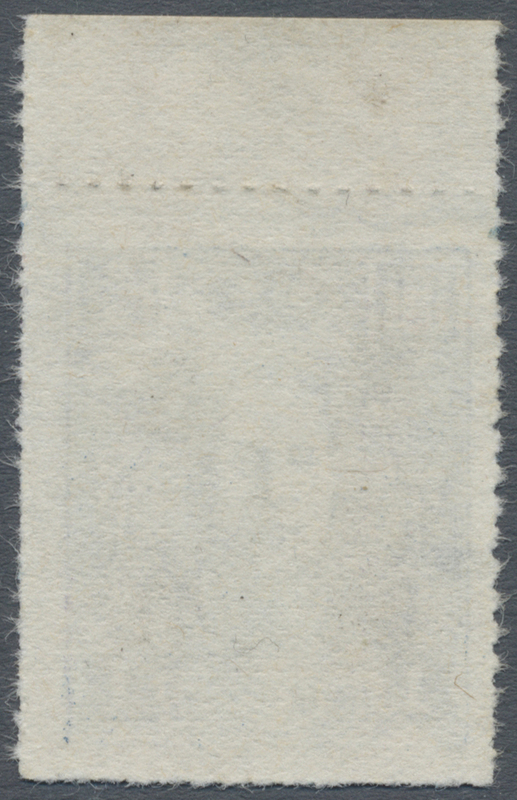 5254 ungebraucht ohne Gummi (unused without gum) (*) Yang NE22 Northeast China, Liaoning Area, 1946, "In Commemorating 1st Anniversary of Liberation of Northeast on August 15" ovpt., $2, unused no gum as issued, small thinning at center rear side, in mint condition probably unique (Yang NE222). 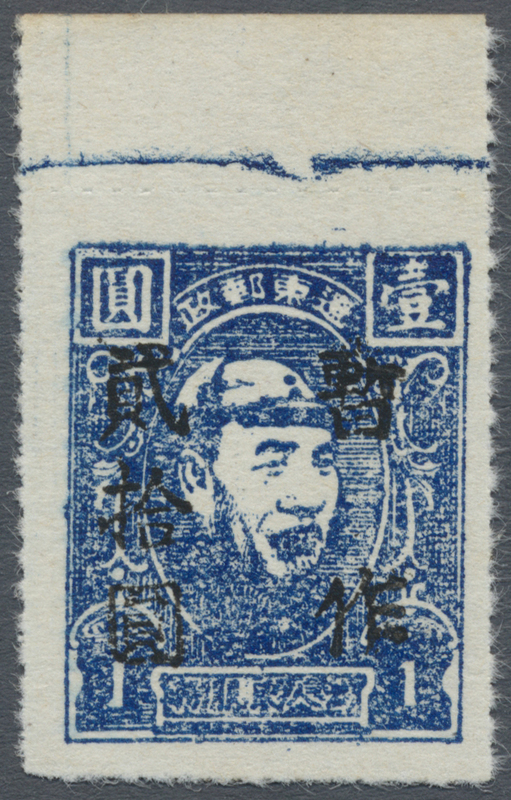 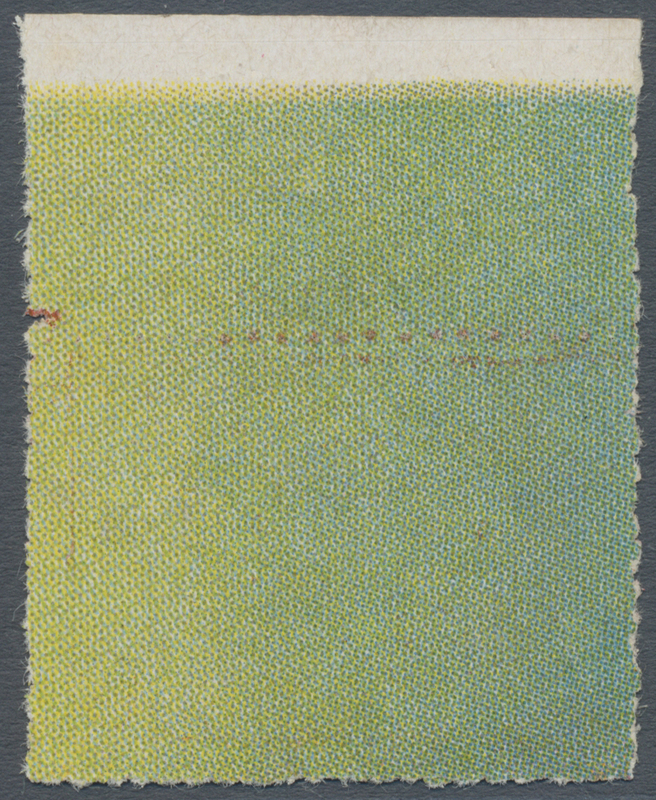 5258 ungebraucht ohne Gummi (unused without gum) (*) Northeast China, Andong Area, 1947, "Temporarily Used for and new value" ovpt., $20/$1 blue, unused no gum as issued, very fine (Yang NE261).